Rising among the factories and body shops off Roosevelt Avenue in Queens, Shea Stadium became the home of the New York Mets in 1964. Named after William A. Shea, the New York attorney responsible for bringing baseball back to the Big Apple after the departure of the Giants and the Dodgers, Shea Stadium has been the setting for many of the game's greatest moments. Able to be converted from a baseball diamond into a football fi eld, the ballpark was home to the New York Jets from 1964 until 1983. 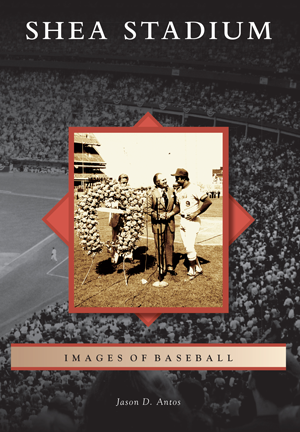 From its opening in 1964 for the world's fair to the unforgettable Beatles concert to the 1969 Miracle Mets, this book covers the history of Shea Stadium through its inception and up to the creation of the new modern-day Citi Field, which the Mets will call home in 2009. Jason D. Antos, a local history writer with a focus on Queens, New York, is a graduate of the University of Miami. In 2006, he authored Whitestone, part of the Images of America series.